If you are planning a big event or party, and are looking for food, you are in the best place. The Hog Roast East Kilbride team is ready and waiting to provide you with a selection of roasted or barbecued meats, canapés, salads, side dishes and desserts that are guaranteed to keep your guests happy. It does not matter whether you are planning a formal sit down event or a casual party we are here to help. Over the years, we have catered for all kinds of parties in the East Kilbride area. Whether you are planning a small family celebration, a large wedding or corporate event we can provide fantastic food that everyone is sure to enjoy. The modern roasting machines can be fitted with different spits. This means that they can be used to cook a range of meats. Whether you want a traditional spitting pig, roast lamb, beef, pork, chicken or turkey our professionally trained chefs can cook it for you. In addition, we offer a wide choice of other party foods. 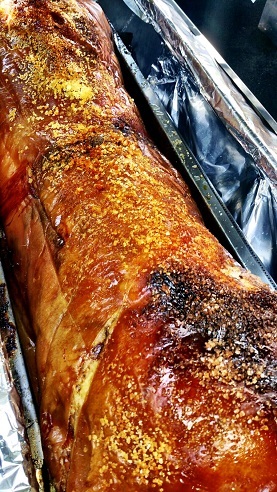 At Hog Roast East Kilbride, we understand that everyone is different, so provide a range of party platters, salads, vegetables and potato dishes as well as spit roasted meats. Our extensive menu includes food from all of the major cuisines, including Chinese, Indian, Thai, British and European options. On the day of your event, our professional team takes care of all of the preparation. If you want us to, we will also serve the food to your guests either as part of a buffet or carvery. We also offer a formal ‘at the table’ service. In addition, there is the option to hire a hog roaster from us. This is a great way for you to impress your guests with your cooking skills. To find out more about the catering service we offer at Hog Roast East Kilbride please fill out the quote form that is included on this website. We promise to get back to you quickly to discuss your needs and give you an accurate price.